The "Blue Bell" is a home built around the turn of the 1900's. The home was brought back to life in 2000 by a local Master Builder who's attention to detail and current building standards are apparent. Fast forward to 2019 and we are fully booked year round and the reviews are consistently positive and the house is well received. We have completely repainted the entire home as well as installing a brand new bathroom, LED Lighting Throughout, and Brand New furniture for you comfortably enjoy during your stay. The outdoor patio which is Rose lined and protected, it offers a cosy area to sit and read or have a glass of NZ wine. The "Blue Bell" has a covered CarPort and ample on-street parking. 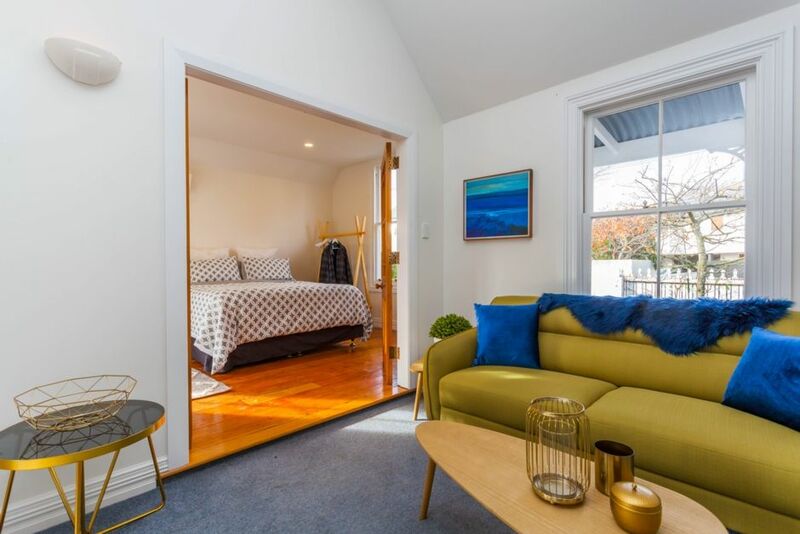 Extras: Cleaning (Required, NZ$75.00 per stay); Linen (included);. Nicola and I have lived in Christchurch since 2011 and love the city we call home. New Zealand offers us the lifestyle and business environment we were not achieving while living in the USA. We are only 10 minutes away from the Bluebell and we are always easy to reach. We fell in love with the "Bluebell" the minute we found it. Once purchased we: replaced the bathroom completely, added a new roof, new hot water cylinder, complete rewire with LED and painted the interior and exterior. New window treatments and all brand new furniture. Quite, safe neighborhood. The edgeware village is newly renovated and has every type of shops and restaurants you will need, literally 200 meters from the front door. The house has ample heating and everyone who stays, loves it. The location is highly rated by those who stay as well. Heat pump Each bedroom has a brand new space heater. All beds have heating blankets. We loved our stay here and would definitely stay here again if we come back! The location was perfect and the house is lovely. Very comfortable and fitted in us and our 3 children very well. Nice comfy beds with plenty of bedding. Highly recommended. The property is nicely presented and well located. The house was so lovely. It was sunny and had a really nice feel. The interior was very classicly done, and it was lovely and warm. Location is good. A small but cute cottage. Master bedroom was lovely and the cottage did have a good fell about it. Great to be able to park our car off the street. Very close to Edgeware shops - walking distance - which was handy. Not that well provisioned if staying more than a day or two (i.e. no laundry powder provided despite there being laundry facilities). Not particularly clean when we arrived and not really that well suited to a young family - we have 3 kids under 7yrs. Very convenient for local shops and bus. Very convenient for local shops and bus.Easy walking distance to ent Christ hurch. It’s a lovely cottage - cosy comfy and very stylish! It’s a lovely cottage - cosy comfy and very stylish! The courtyard and garden are so pretty at this time of year! We really enjoyed our stay at Bluebell cottage. Thanks!